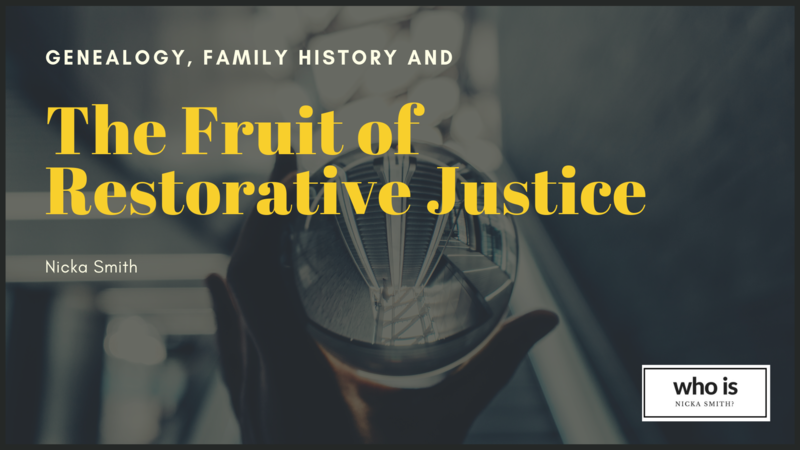 Genealogy, Family History, and the Fruit of Restorative Justice - who is nicka smith? Restorative justice is already happening. But how can genealogists and family historians contribute and make even more of a difference? But what if I told you that reparations efforts and programs already exist all over the country? What if I told you that universities, corporations, and private citizens were already practicing restorative and transformative justice for past wrongs connected to the enslavement of the ancestors of African Americans and that these things are totally a form of reparations? The identity of African Americans is always being questioned. Always. 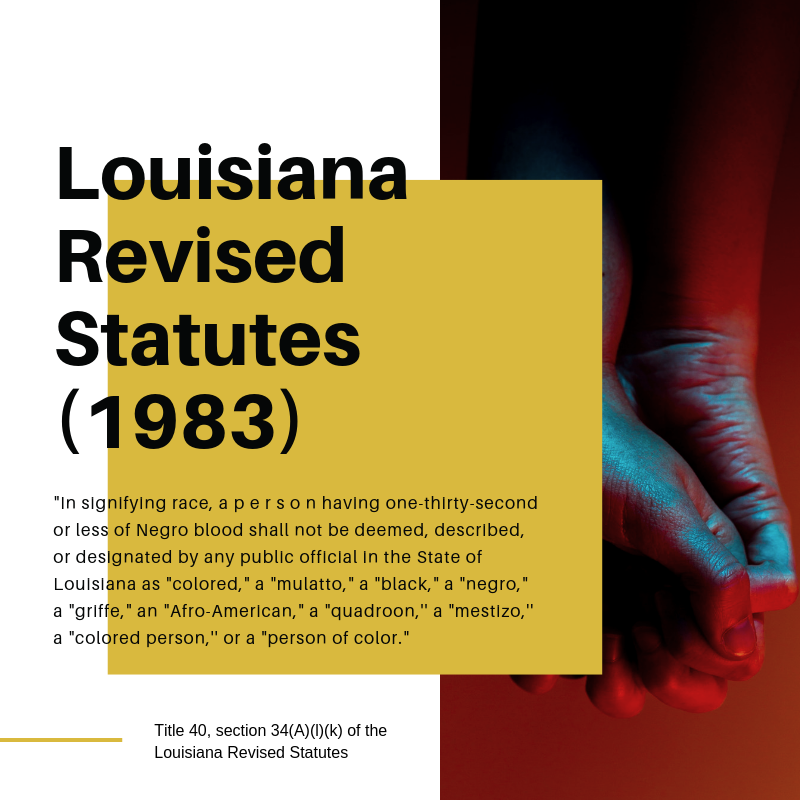 From the ridiculous caste system established in states like Louisiana to legally defining “Colored” people in Virginia, it has always seemed like the system – and those in power – have been busy defining who we are. Eugenics, and it’s byproduct genealogy, are at the center of this. As a result, our very legitimacy is always in limbo. It was a deliberate choice to bring our ancestors here. Capitalism was at the heart of the complex root system of a tree that grew leaves of different shades of slavery throughout the country. On other hand, as a descendant of those captured and worked for free, it doesn’t appear to me that those who planted that tree really thought out all the scenarios once their pet economic project played itself out. It may have been impossible for them to do so. Hindsight can be a hell of an elixir. I cannot ever think of a time in U.S. history where African Americans existence was ever 100% completely lawful, in word (read that the law) and deed. Even now. Yes, the social and legal status of the enslaved was well documented on paper, but that documentation, when looked at on a national scale, did not fully legislate their humanity. States rights, right? Unfortunately, the same could be said even now. The word/law mostly reflects our humanity but the deeds supporting such, from the government to private citizens, are so inconsistent when the point shouldn’t ever be argued. Until 1983, If a person had just one 3x great grandparent who was 100% African descent, and they lived in the state of Louisiana, they were considered African American/Black, by law. Genetically, this means anyone with more than 3% African ancestry was considered African American. When the very fact of our existence in the U.S. is treated as lawful and its complete origins and missteps are acknowledged, our identity can no longer be questioned. In 2019, this has never happened. The only way to shine a light on that is to atone the centuries of false information and correct the record with the truth. Genealogy and family history are a way to do that. Millenials are more open to the idea of slavery reparations. This makes sense because they are more diverse than predecessor generations and by virtue of that they are researching more than one type of ethnic group when they become interested in their family history. It’s why experienced researchers have seen so many within our lists of DNA matches. These young people are hungry for the information and it doesn’t matter the race or ethnic group of the folks they’re looking for. Let’s dig into this deeper. The roots of our own industry are tainted by the pseudoscience of eugenics whose aim was to improve humanity and rid it of certain populations in an effort to protect it. Genealogy was the tool used to filter people in and out of grace. People of color being involved in the genealogy industry, either as a novice or a professional, goes completely against the racial ideology at the time genealogy was embraced and against the origins of the study. Involvement now allows people of color to perform their own atonement on behalf of their ancestors who were considered disposable and their lives unimportant. It’s a proactive way of re-establishing identity while enhancing the knowledge of legacy for future generations. The system of enslavement within the U.S. made it impossible to research the enslaved without researching their former slaveholders. No one can truly be successful in doing this research any other way. Just as the descendants of the formerly enslaved are restoring the voices of their ancestors, the descendants of those former enslavers can also do that. That, on both ends, is restorative. Accurately and humanely telling the stories of all ancestors who lived during the slavery era is a form of restorative justice, but we’ve got to move beyond the acknowledgment phase. 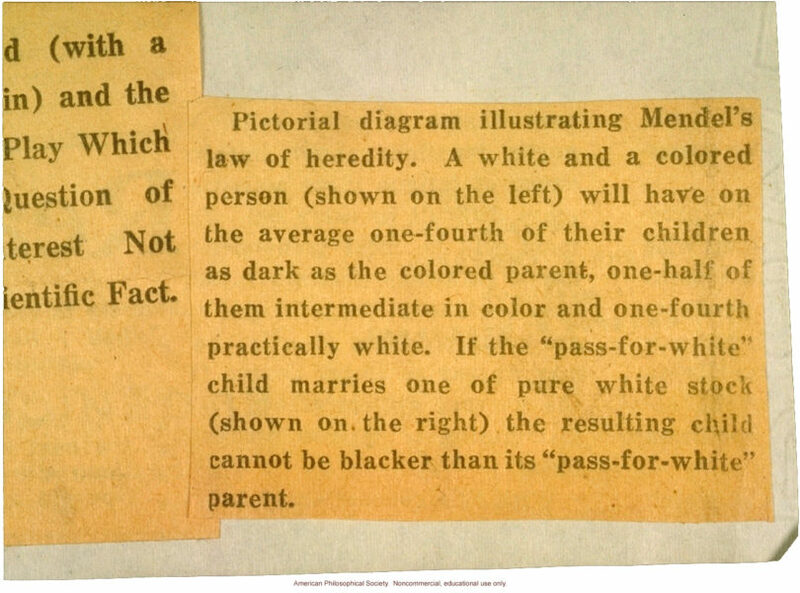 In 1915, the eugenics movement was opning about whether or not it was possible for a bi-racial person to produce an African American child if they married a "pure white." Hilarious and sad considering that laws in states like Louisiana meant the child was Black anyway. 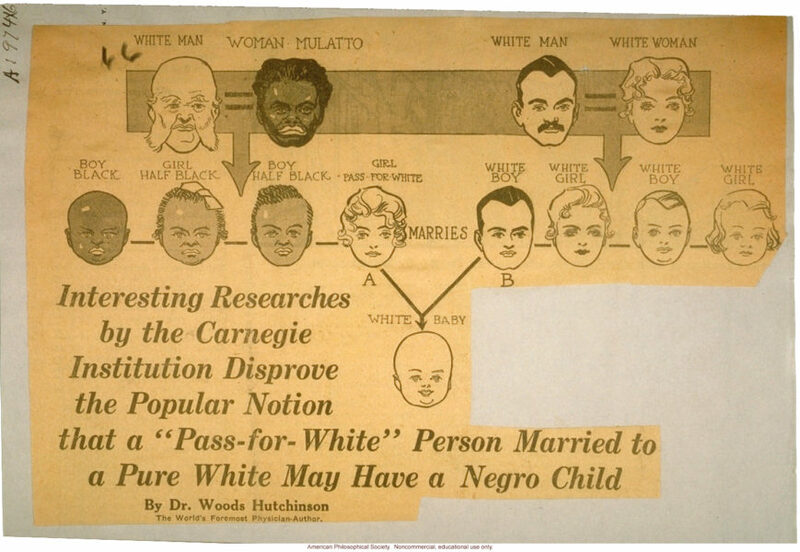 Source: American Philosophical Society, 1915, side A. Eugenic Archives. American Philosophical Society, 1915, side B. Source: Eugenic Archives. I’ve been contacted A LOT by the descendants of former slaveholders asking what they should do when they come across documents in their family’s possessions or online as they research. They want to move beyond the words and into action. I’ve suggested everything from creating a free blog where you post your documents, to donating them to an archive or university, to posting on social media, to tracking down descendants, and more. It’s all a personal choice, but if we’re speaking about it truthfully, based entirely on definitions, it’s a form of reparations. create a project to transcribe inventories mentioning the enslaved in your counties/parishes of interest; and more. These are just a few acts of restorative justice that don’t involve an endlessly spouting ATM or programs that some view as unfair. They correct the largely inaccurate narrative of slavery and the multitude of misinformation about the lives of African Americans and most importantly, help restore legitimacy and legacy. These things can done by regular people who aren’t famous, with no need for degrees or credentials. Do you know how much influence you have in your own family and social circles as you pass on what you learned after an act of restoration? No one should be waiting for a corporate sponsor; we have the tools and we have the knowledge. It’s time to stop waiting for “someone” to change the story and make things right. We have billions of historical documents along with DNA to guide the journey. Let the words of atonement be spoken, the actions of restoration take place without fear, and the results be fruitful, and a blessing, to everyone. Below is a short list of news stories, existing projects, groups, and corporations that highlight the type of work that is needed. Many of these changes were made as a result of voices outside these places advocating on behalf of the voiceless. Keep that in mind as you ponder what you’ll do. “Within the boundaries of the “Habitation Haydel”, as the Whitney Plantation was originally known, the story of the Haydel family of German immigrants and the slaves that they held were intertwined. In 2014, the Whitney Plantation opened its doors to the public for the first time in its 262 year history as the only plantation museum in Louisiana with a focus on slavery. “Daughter, mother, sister, aunt. Inherited as property. Seamstress. World traveler. Enslaved woman. Concubine. Negotiator. Liberator. Mystery. Sally Hemings (1773-1835) is one of the most famous—and least known—African American women in U.S. history. For more than 200 years, her name has been linked to Thomas Jefferson as his “concubine,” obscuring the facts of her life and her identity. “ Click here for additional news coverage. Click here for the Plantation and Slavery exhibit. Black History Month Memorial Service: “An annual commemoration of those enslaved at The Hermitage and throughout the country. Held at The Hermitage Church. The service concludes as attendees join in a procession to the slavery memorial “Follow the Drinking Gourd” located behind the church. 150 flowers will be laid, marked with the names of all those known to have been enslaved at The Hermitage. Click here for The Hermitage Slavery Exhibit. “There is an interesting picture that hangs in Mr. Jack Daniel’s old office. It’s a picture of Mr. Jack taken with his Distillery crew. What makes the portrait so intriguing is the gentleman sitting immediately to Jack’s right, an African-American worker. Given the time period when this photograph was taken – around the 1900s – and the racial divide that permeated the American South, it’s intriguing to see an African-American man seated beside the proprietor of a business. But their proximity to one another in this photo underscores the remarkable relationship that is at the heart of how Jack came to make whiskey. The man in the photograph above, we have reason to believe, is George Green. Along with being Jack’s friend, George was also the son of Nathan “Nearest” Green. And it’s Nearest Green, along with the Reverend Dan Call, who taught Jack Daniel about making whiskey at a still owned by the Lutheran minister.” Click here for additional news coverage. “Princeton University, founded as the College of New Jersey in 1746, exemplifies the central paradox of American history. From the start liberty and slavery were intertwined. Princeton educated leaders of America’s fight for independence and hosted the Continental Congress in 1783. But the University’s first nine Presidents all owned slaves, a slave sale took place on campus in 1766, and enslaved people lived at the President’s House until at least 1822. One professor owned a slave as late as 1840.